Snapdeal’s investors aren’t pleased with news reports that their company has rejected a “$700-$750 million” acquisition offer by Flipkart. “Rejected! Snapdeal dismisses Flipkart’s #ETBrandEquity. media and unethical false reporting. invest in startup that can filter fake facts,” Kalaari Capital’s Vani Kola tweeted. But what makes Kola’s outburst interesting is that Economic Times — like her company, Kalaari Capital — happens to be an investor in Snapdeal. In 2016, Economic Times’ parent company, Bennett Coleman and Co. Ltd., had purchased a stake in Snapdeal in exchange for advertising space in its media properties. Even more interestingly, Bennett Coleman and Co. Ltd is also a small investor in Flipkart, having purchased a Rs. 260 crore stake in February this year. Deals like these are common in the media space, with large publishers such as TOI and Hindustan Times buying stakes in companies in exchange for ad space. “Such deals were once controversial, especially because they also involved positive media coverage. Since then, however, such deals have become commonplace and transparent, and have to meet mandated disclosure norms,” says a Livemint report. In addition from Flipkart and Snapdeal, the Times Group is also an investor in companies like Uber, Coursera and Haptik. 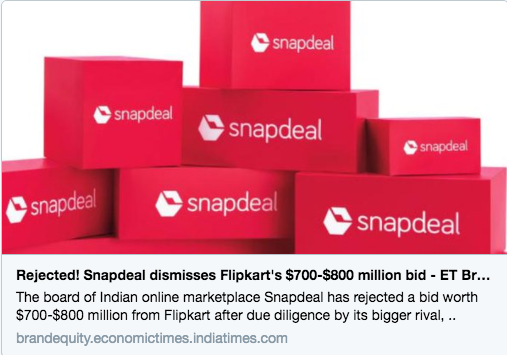 Economic Times, including a host of other outlets, had earlier reported that Snapdeal had rejected a $750-$850 million offer from Flipkart. Flipkart and Snapdeal have been negotiating for a sale for a while now, but have been unable to yet find common ground. The deal has also reportedly run into several hurdles, including infighting among Snapdeal’s bigger investors, and objections raised by its smaller investors, including Azim Premji. Snapdeal, too, has been beset by controversy, having recently been sued by several sellers who’ve claimed they haven’t been paid. Snapdeal too has sued the former promoters of its subsidiary, GoJavas, accusing them of cheating, forgery and conspiracy.